Please visit Patter's blog HERE so you can read her teaching based on the word "Truth". 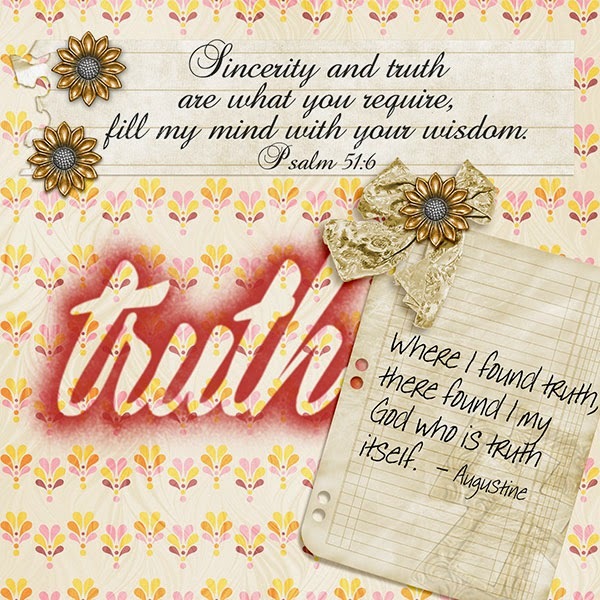 When searching for what Bible verse to use for my digital artwork I came across the Good News Bible's version of Psalm 51:6 which I have used on my page. I am claiming this verse as a prayer for myself because I know that I need the Lord's help to have my mind filled with His wisdom. I cannot do it in my own strength. For my digital artwork I recently discovered Digital Scraper and have been watching and reading through the great tutorials they have and I wanted to try something I have learnt on this page - the stenciling of a word. It was fun to create and I can see me doing more of this. It's a wonderful verse Anne-Marie and love how your stencilled Truth stands out ! What a great verse and what a great quote. I really like how you did the word TRUTH.